1ac Maybe contract’s no good for a newly-wed (5) was a nice clue to start off with and led to BRIDE. How obliging of Jago to tell us answer lengths. It seemed obvious to move on to 1dn We burp drunkenly, emptying beers in places where they’re very local (8), a clue which no doubt had Shirley rubbing her hands with glee. A bit of thought led to BREWPUBS (entry length 6), and it looked like it would be the Bs that were deficient. 9ac BENEFIC, 3dn BEFANA and 16ac UMBRAE all confirmed this, and I liked the way that both the B (from the NW quadrant) and two Is (in the NE) of BRANDISHING went missing. As the preamble said, entries spanning two quadrants had appropriate deficiencies in both. And so I worked round the grid, 8dn INCONTINENCE and 14dn EMBELLISHED helping with the missing C from the SE qudrant and missing D from the SW respectively. It was, in fact, the SE unclued entry that gave the game away for me with SCURVY, lack of Vitamin C. With BERI-BERI and RICKETS dealing with the vitamin B and D deficiencies in the NW and SW corners, all that remained was to check that GOITRE was caused by a lack of vitamin I Iodine. As I suspected, this was a straightforward solve — about 1½ hours — but nonetheless good fun. I was surprised that the theme hadn’t been used before.3 Thanks, Jago. 1 I couldn’t find any reference to Harrogate this week. 2 Chambers gives deficiency disease n a disease due to lack of necessary substances (esp vitamins) in the diet, such as rickets, scurvy, beri-beri, pellagra. 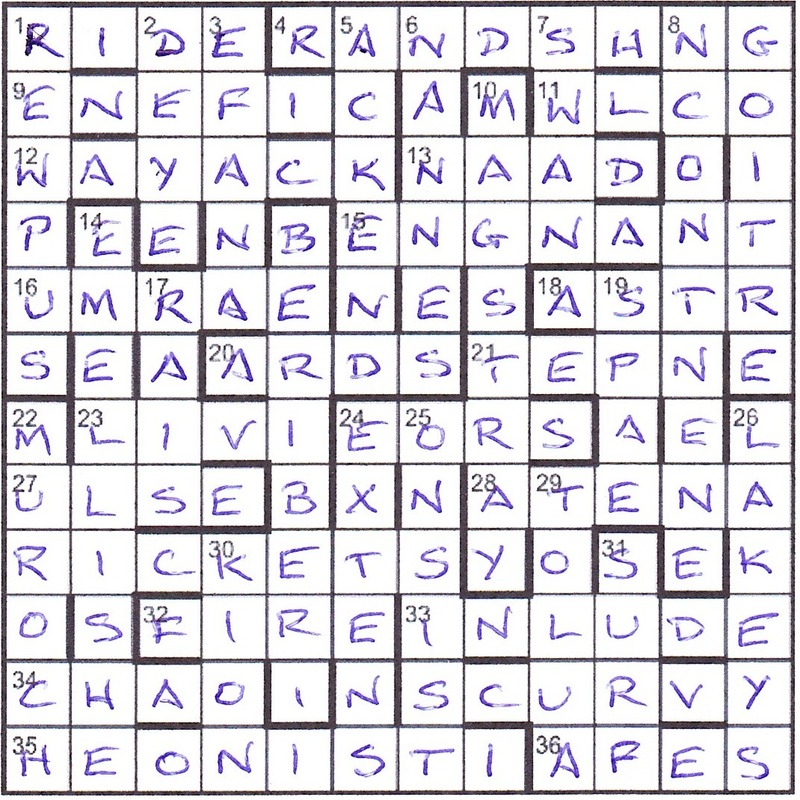 3 An Independent Weekend crossword back in 2001 did have Xerophthalmia as its theme — a complaint leading to dry eyes, which can be a result of vitamin A deficiency, hence some entries were entered without an A. This entry was posted on 16 September 2016 at 3:59 pm	and is filed under Solving Blogs. You can follow any responses to this entry through the RSS 2.0 feed. You can leave a response, or trackback from your own site.